For other people named Henry Muhlenberg, see Henry Muhlenberg (disambiguation). Henry Melchior Muhlenberg (an anglicanization of Heinrich Melchior Mühlenberg) (September 6, 1711 – October 7, 1787), was a German Lutheran pastor sent to North America as a missionary, requested by Pennsylvania colonists. Integral to the founding of the first Lutheran church body or denomination in North America, Muhlenberg is considered the patriarch of the Lutheran Church in the United States. Muhlenberg and his wife Anna Maria had a large family, several of whom had a significant impact on colonial life in North America as pastors, military officers, and politicians. His and Anna Maria's descendants continued to be active in Pennsylvania and national political life. Muhlenberg was born in 1711 at Einbeck, to Nicolaus Melchior Mühlenberg and Anna Maria Kleinschmid in the German Electorate of Brunswick-Lüneburg (also known as Hanover). He studied theology at the Georg-August University of Göttingen. As a student, Muhlenberg came under the influence of the Pietist movement through fellow students from Einbeck who had worked at the Francke Foundations in Halle (Saale), an important Pietist institution. With two other men, Muhlenberg started a charity school in Göttingen that eventually became an orphanage. After completing his studies in spring 1738, Muhlenberg secured a teaching position at the Francke Foundation's Historic Orphanage. Its director, the theologian Gotthilf August Francke was the son and successor of the Foundation's founder, August Hermann Francke and a professor at the University of Halle. Muhlenberg was ordained in Leipzig in 1739, and served as assistant minister and director of the orphanage at Grosshennersdorf from 1739 to 1741. In 1741 Gotthilf August Francke encouraged Muhlenberg to accept a call from German-speaking Lutherans in Pennsylvania. Accordingly, in 1742 Muhlenberg emigrated across the Atlantic Ocean, where he essentially founded the Lutheran Church as an institution in North America. Exterior of the Old Trappe Church founded by Henry Muhlenberg. Note: Caption date is wrong; he founded it in 1742 or later. The Lutheran churches in Pennsylvania had largely been founded by lay ministers. As Nicolaus Ludwig Zinzendorf was successful in winning a number of converts to the Moravian Church, the Lutherans asked German churches for formally trained clergy. In 1742, Muhlenberg immigrated to Philadelphia, responding to the 1732 request by Pennsylvania Lutherans. He took charge of the congregation at Providence (Augustus Lutheran Church), in what is now Trappe, Pennsylvania. He also provided leadership to a series of congregations from Maryland to New York, working to secure control over less qualified pastors and starting new congregations among the settlers of the region. In 1748 he called together The Ministerium of Pennsylvania, the first permanent Lutheran synod in America. He helped to prepare a uniform liturgy that same year, and also wrote basic tenets for an ecclesiastical constitution, which most of the churches adopted in 1761. He did much work on a hymnal, published by the Ministerium in 1786. The dedication stone of the Augustus Lutheran Church, above its door, is dedicated to Muhlenberg and its other founders. It reads, in Latin, translated into English: "Under the auspices of Christ, Henry Melchior Muhlenberg with his Council, J.N.Crosman, F.Marsteller, A.Heilman, J.Mueller, H.Haas, and H.Rebner, erected from the very foundation this building dedicated by the Society of the Augsburg Confession. A.D.1743." This is the only known church building bearing an inscription that designates the confessional document of the congregation instead of the name Lutheran by which it is popularly known. The name of the first church—Augustus—was adopted in honor of Herman Augustus Francke, founder of the Halle Institutions, whose son persuaded Muhlenberg to accept the call of the three United Congregations in America, the first such confederation to bring Lutheranism to North America. Henry Melchior Muhlenberg House in Trappe. Muhlenberg frequently traveled beyond the three congregations assigned to him. During his 45-year ministry, he reached from New York to Georgia. He ministered not only to the German-language populations he was assigned to, but to colonists from the Netherlands and Britain as well, in their native languages. His colleagues requested his help in arbitrating disputes among Lutherans, or in some cases with other religious groups. Muhlenberg also worked to recruit new ministers from Europe and to develop more ministers from the colonists. In Washington Township, Morris County, New Jersey, the Old Stone Union Church (built 1774) of German Valley (later renamed Long Valley) housed a congregation said to have been organized by Muhlenberg. His eldest son, the Reverend Peter Gabriel Muhlenberg, also served as pastor there and served as a major general in the Continental Army. Poor health forced him into limited activity and retirement. He eventually died at his home in Trappe, Pennsylvania. He was interred in the rear of Augustus Lutheran Church with his wife Anna Maria, followed by their son Peter. By request, he was buried next to the grave of his good friend and sponsor, Augustus Church co-founder Frederick Ludwig Marsteller. Soon after arriving in Pennsylvania, in 1745 Muhlenberg married Anna Maria Weiser, the daughter of colonial leader Conrad Weiser. The couple had eleven children and founded the Muhlenberg Family dynasty, where generations were active in the US military, politics, academia and ministry. Of their children, three sons entered the ministry and became prominent in other fields as well. Their son Peter became a Major General in the Continental Army and later was elected to the U.S. Congress. Frederick served as the first Speaker of the House in the U. S. Congress after his election to office. Henry, Jr. became pastor of the Zion Lutheran Church at Oldwick, New Jersey. Henry Ernst was an early scientist, and the first president of Franklin College (now Franklin & Marshall). Their daughter Elisabeth married future general Francis Swaine. Maria Salome (“Sally”) married the future US Congressman, Matthias Richards. Eve married Emmanuel Shulze, and their son John Andrew Schulze was elected Governor of Pennsylvania. Henry Melchior Muhlenberg is commemorated in the Calendar of Saints used by some Lutheran Churches in the United States on October 7. 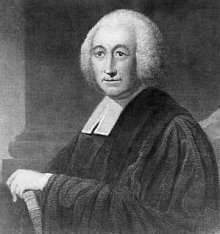 Muhlenberg is honored with a feast day on the liturgical calendar of the Episcopal Church (USA) on October 7. Muhlenberg College in Allentown, Pennsylvania is named in his honor. The Muhlenberg Monument entitled "Man of Vision", sculpted by US artist Stanley Wanlass, is located on the campus of Muhlenberg College. Lake Muhlenberg, located near the college in Allentown, is named in his honor. The Henry Melchior Muhlenberg House was added to the National Register of Historic Places in 2000. 1 2 3 Bowden, Henry Warner. Dictionary of American Religious Biography, Westport, CT: Greenwood Press, 1977. ISBN 0-8371-8906-3. ↑ Pitney, Henry Cooper. A History of Morris County, New Jersey: Embracing Upwards of Two Centuries, 1710-1913, p. 174. Lewis Historical Publishing Company, 1914. Accessed September 24, 2015. "The stone church was built by the same congregation as a union church in 1774. This old church was peculiarly built, it had no gable end nor steeple, the roof sloping down to the walls on four sides. Inside there were galleries on three sides, the little pulpit box standing on one leg under an immense sounding board. First among the Lutheran preachers in the valley was Rev. Heny Melchior Muhlenberg, D.D., known as the 'Father of American Lutheranism' (remembered by Muhlenberg College, Allentown, Pennsylvania), a man of great learning and deep piety." ↑ "Old Stone Church". Morris County Heritage Commission. 2015. Retrieved 2015-09-24. ↑ Wallace, Paul A. W. (1950). The Muhlenbergs of Pennsylvania. Philadelphia, Pennsylvania: University of Pennsylvania Press. p. 90. She was only fifteen when, on May 8, 1782, she was married to Matthias Richards, a prosperous saddler of Boyertown, Pennsylvania. Riforgiato, Leonard R. (1980). Missionary of Moderation: Henry Melchior Muhlenberg and the Lutheran Church in English America. Bucknell Univ Press. "Muhlenberg, Henry Melchior". Encyclopædia Britannica (11th ed.). 1911. "Muhlenberg, Heinrich Melchior". New International Encyclopedia. 1905. "Muhlenberg, Henry Melchior". Appletons' Cyclopædia of American Biography. 1900.